'Gather' is the Advent Word for today in the online global advent calendar that I am following. You can follow Advent Word on Twitter @adventword or sign up at Advent Word to receive a daily email during advent with the image and very short meditation. GATHER with others to see the Beloved One, the Christ and your neighbour.GATHER unto yourself the sorrows of this world. That will be an act of true joy." 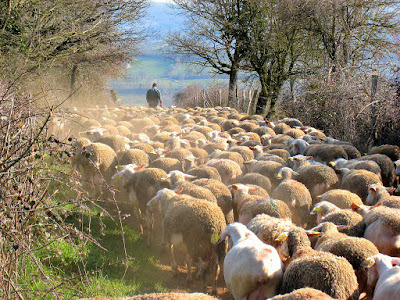 The image I have chosen in response to the word 'gather' is that of a flock of sheep. The image at the head and foot of this page shows the sheep walking close together, following their shepherd on a narrow way. I chose it because one of my favourite Bible passages is the prophetic vision in Isaiah 40 of the comforting of God's people by a powerful God who strengthens the powerless and cares gently for the vulnerable. and gently lead the mother sheep."